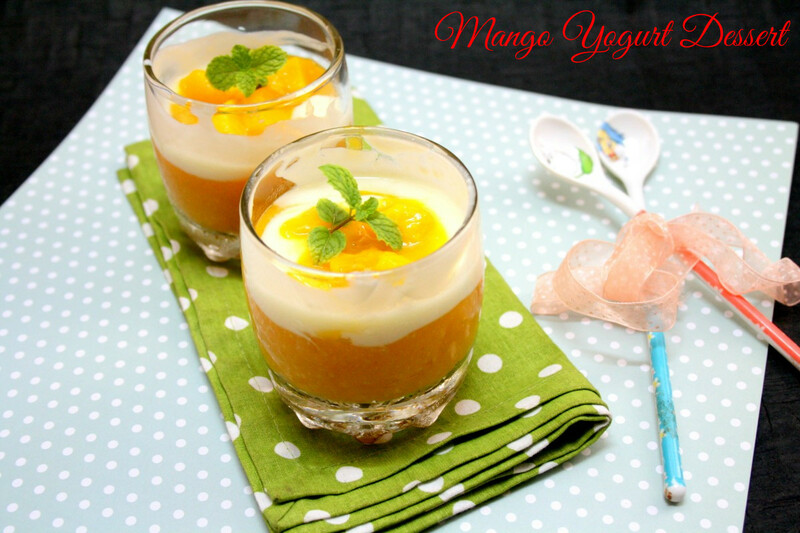 For the final day of cooking fruits for Kids, its a delicious and superb addictive Mango Yogurt Dessert or should I say a parfait made with mango puree, thick yoghurt blended with Cinnamon Jaggary Syrup. Though I had planned for something else, I had to make this to take care of the overflowing mangoes in the fridge, plus the fact that they were crushed. My SIl who visited us recently got a whole huge cart of mangoes, unfortunately some of them got crushed and even though it was just rightly ripe, it was soft. There was no chance to slice it or dice it. It had to be consumed as puree. 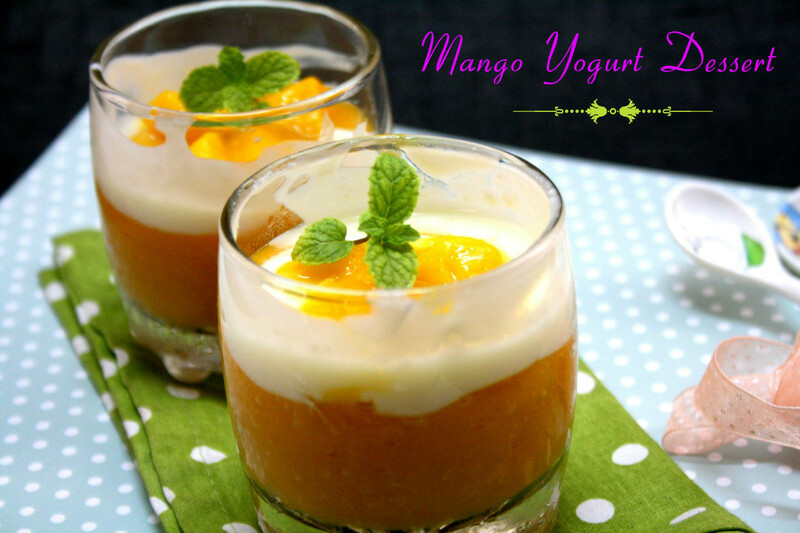 If you have excess mangoes and are bored of eating as such, you can make this calorie rich and laborious method of enjoying a mango than simply as a fruit. Yes as I said we do not make dishes with mangoes and prefer eating as fruit. However when you have overflowing on hand, you got to think of ways to use it. 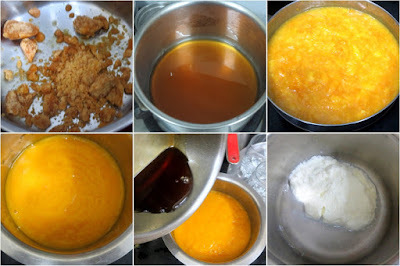 Hubby dear has been asking me to make the Chancaca Syrup again. Ever since I made it, he has been after me to make it. Remembering that, I wanted to bring in similar taste to this dessert and made a jaggary syrup in an almost similar method. Since its very rich, I thought serving this in small single serving glass will be better. Even these small glass portion felt heavy for me. However you can enjoy this over two times. Though I have enjoyed all varieties of mangoes, I personally love Banganapalle/Benishan. Infact I feel Alphonsa doesn't meet the taste. While Banganapalle/Benishan is from Andhra, Mulgoba is from Tamil Nadu which is my favorite again. I wonder why I haven't eaten Mulgoba this season at all! So that reminds me that I ought to check the stores, meanwhile you make this to enjoy your weekend meal! Hung the curds over a muslin cloth till you get thick curds. Whisk with Castor sugar and chill it. 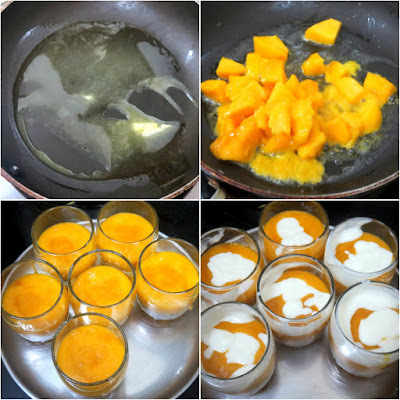 Meanwhile make mango puree and refrigerate. To make the jaggary syrup, melt grated jaggary and remove scum if any. Then add cinnamon stick, and continue boiling to make a thick syrup by boiling it over low flame for 10 mins. Add lemon juice towards the end and remove. Do not boil after adding the lemon juice. 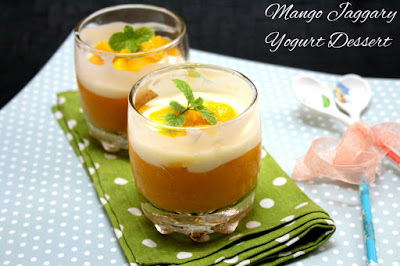 Allow to cool completely and add to the mango puree. Transfer to serving bowls. And chill for 30 mins. then remove and spread a layer of yogurt on the set mango layer. Chill again for 30 mins. Meanwhile heat a non stick pan with butter, saute the mango pieces. You could mash some as you prepare. Let it get browned, this takes about 5 mins. Remove and top the parfait with this layer. Serve it chilled or hot mango pieces. I tasted both hot mangoes pieces and chilled, both tasted great. I actually wanted to make Mango Compote but just went with buttered mangoes.